It does stand out. 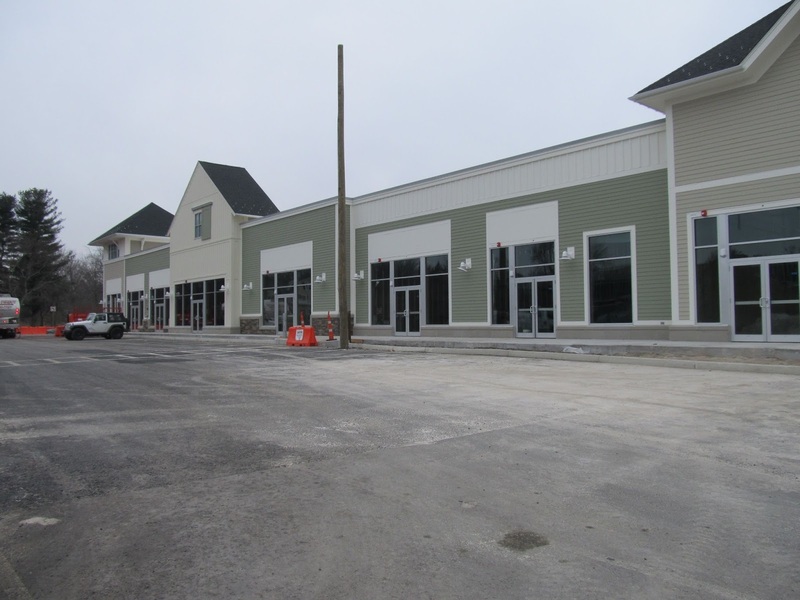 That location is difficult in that it's hard to see the retail from the roadway. I'm guessing that's why they went with a bright yellow sign. But where is our favorite, Luigi's! I've been to Red Heat a couple of times. It's OK, and I appreciate the selection of craft beers on tap, but face it, it's no substitute for Luigi's. Lincoln Liquors has better beer prices than other places around, so I've been a customer there, too. The issue I see coming up is parking. Even now, in the middle of the day with only a few of the new buildings open for business, the whole lot is full. What's going to happen at 6 PM with more stores and restaurants? Remember the words of the prophet Yogi Berra: "Nobody goes there anymore. It's too crowded." Thanks for your comments. I like the Yogi quote! Currently the construction is taking up a lot of space that will eventually be converted back to parking. There is a lot of extra parking to the side of Red Heat and behind the building housing Bank of America that is not being used. That being said I think you are right that the "nearby" parking will be pretty full. Overall, a very nice post. 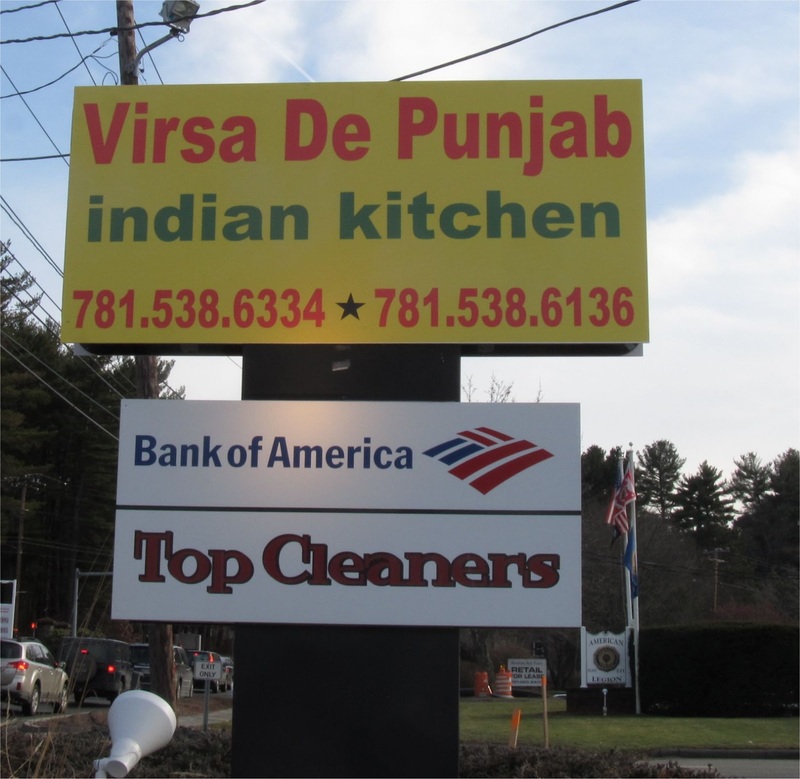 One quick edit is you misspelled the name of the Indian Restaurant "Virsa De Punlub". I'm not sure if there is a place called Punlub, but it should be changed to Punjab (which is a real place). That being said, I agree with the other comment that the sign while distinctive, would be more appropriate in Malden or Brockton. Sheesh, it's hard to be located across from McDonalds and the only Welfare Motel in the area! Good catch. It's been fixed. Thank you. It is across from McDonalds but the lot slopes down so it's hard to see well from the roadway especially at night. Hi, I was wondering whether the Thai restaurant Ka Noon is returning? It's not returning to Bedford. It might be opening a location in Burlington though. Just a quick note that the bright yellow Virsa De Punjab has been replaced. You can see the new sign here.